USPA provides a platform for your journalistic work, and its press pass opens many important doors. Even people with non-traditional backgrounds or part-time media professionals can get a successful start as journalists or photojournalists thanks to USPA. An international press pass is extremely helpful for your journalistic work! Having the backing of an agency makes your daily work easier - you stand to benefit from various tools we readily supply. For instance, we provide you with documentation that identifies you as a legitimate member of the press and offer the possibility to disseminate your articles and press photos through our own marketing channels such as USPA News. Our international press pass is accepted around the globe and may be used immediately. Media professionals know the importance of well-developed information channels, particularly in times when we are inundated by news on a daily basis. That´s why USPA advocates relaying information where it is expected: to the editors and journalists. We develop individual ways of communication and provide you with an extensive selection of accurate reports through the most important information channels. Furthermore, we increase editorial interest through close communication with our network partners. USPA is actively seeking direct contact with journalists and lends support wherever it is needed, among other things by issuing the coveted press passes. The USPA Reputations Service also communicates your unique selling propositions and provides you with information that is important for your job as a media professional. More and more businesses, start-ups, associations and clubs are taking advantage of the multimedia conveniences offered by the Internet. That´s why USPA is consistently expanding its distribution system in order to guarantee the safeguarding of premium information for journalists. Our focus lies on a cooperation between journalists and editorial offices, and we are delighted that numerous clients from various business sectors have placed their trust in the services offered by USPA. You, too, could benefit from our communication modules, which are targeted to all your needs - effective, digital and timely! By joining USPA News, you are entering a world of interesting alternatives for publishing your editorial content. Publish write-ups, news, professional articles or investigative reports through the international news service USPA News and benefit from a systematic and steady supply of editorial contacts and readers. Tip: As a USPA member, you are entitled to a special discount on all extended USPA News services. Simply look up your rebate code by logging in and start using it immediately! The three pillars of support behind USPA´s success are professional qualification, journalism and PR. We expressly distance ourselves from journalism unions and press associations. You will receive your international press pass even if you are working as a part-time journalist! 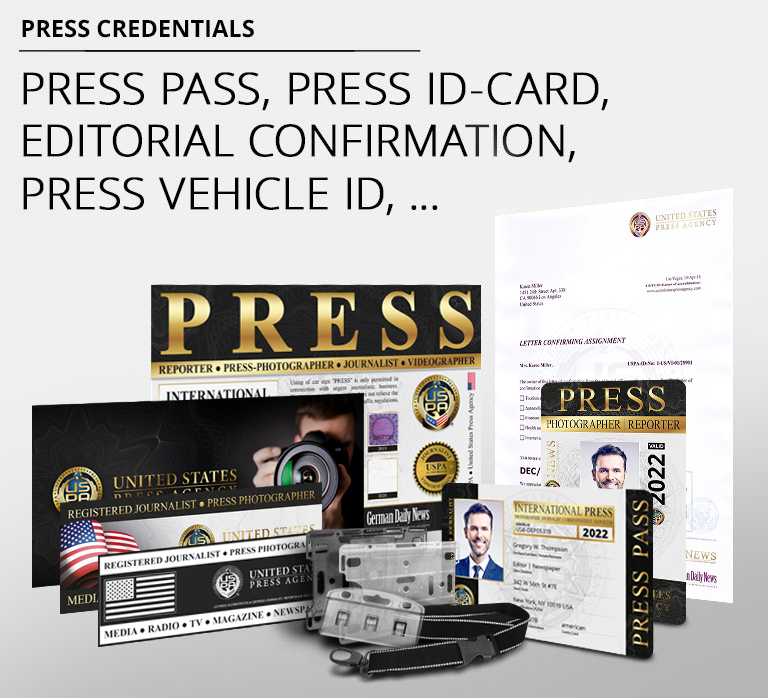 The international press pass offers effective long-term support for your journalistic work. Even non-members may apply to receive a press pass. Start using our long-standing experience as a strong partner for journalists, publishing houses, PR offices, reporters and online editorial departments to your own advantage. We are financed exclusively through membership fees and are thus able to guarantee our complete political and financial independence.